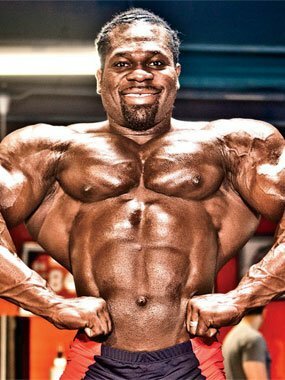 The is what IFBB pro Lionel Beyeke packed onto his frame heading into the 2011 contest season; not a guy who never trained before, not a guy with no concept of nutrition, but a 225-pound pro. If he had room to grow, then you do, too, and we've got the plan for your next growth spurt. This isn't about some crazy new training technique, cutting-edge supplement or revolutionary diet. Those aren't what Beyeke got when he called on leading industry trainer/nutritionist Hany Rambod. Instead, he got a prescription for hard work and the knowledge to grow. And we're going to share it with you. growth spurt of many to come. 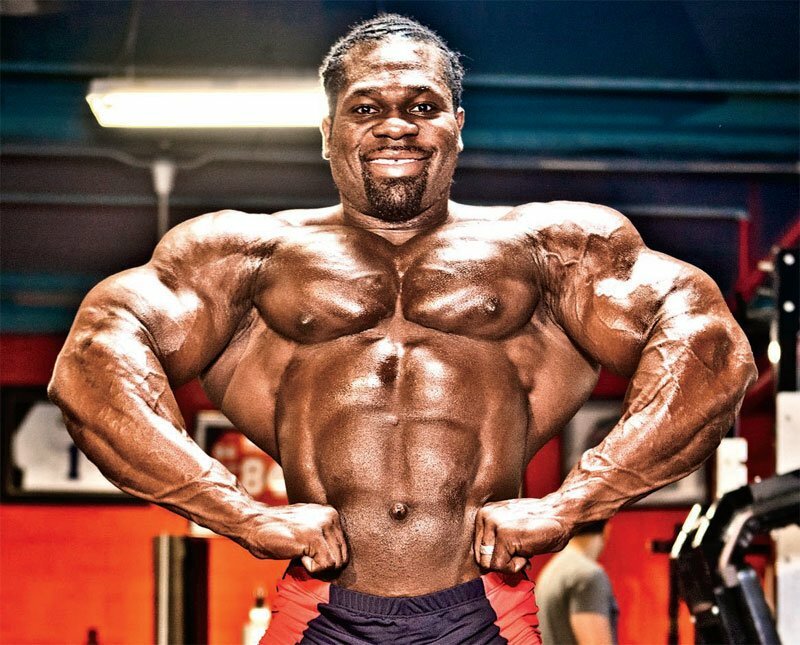 Beyeke's unrefined physique displayed genetic gifts and limitless potential when he placed sixth in his pro debut at the 2010 Phoenix Pro. With full, round muscle bellies and a flowing X frame, this guy had all the tools but just not enough lumber. Beyeke realized he lacked the knowledge to reach his potential. As a resident of France, he had never been exposed to the training and nutrition resources that some people in the United States take for granted. All he needed was a solid plan, so the day after his sixth-place finish, he called on the best in the business: Hany Rambod, the man guiding the contest prep for guys like Jay Cutler and Phil Heath. Rambod's three-pronged attack focused on basic exercises, sound technique and consistent progress. He also formulated a diet that was sure to fuel Beyeke's workouts without making him an overstuffed mess. The result? 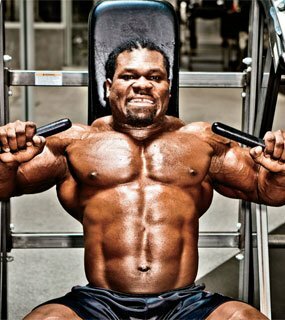 Beyeke showed up at the 2011 New York Pro with 252 pounds of flowing muscle. He placed fourth there and qualified for the Mr. Olympia. A few weeks later, he placed second at the Toronto Pro and proved himself a future threat on any stage. Most sets are 8-10 reps, the ideal range for muscle growth. The first two sets of the first exercise for each bodypart are warm-ups. The last two are working sets. The first working set comprises 8-10 reps to failure, plus 2 forced reps. The last working set will include 8-10 reps to failure, 2 forced reps and 3-5 partial reps at the end. Rest between sets will be 90.120 seconds, except for leg exercises, which can be a little higher. Cardio is to be performed three or four times per week, 20-30 minutes per session, first thing in the morning. Use a stair-climber machine and maintain a heart rate of 135 beats per minute. 1. CHANGE IT UP Don't let your body get used to anything. Every three to four weeks, change the exercises and the order in which they are done. Change the angles by using different hand/foot positions. Rest periods can also change; this is an often-overlooked training variable. 2. REST On at least two days per week, stay completely out of the gym. This means no lifting! And don't neglect sleep - this is one of the most overlooked factors in muscle growth. Sleep equals time to grow. 3. GOALS Create mini goals. Don't just expect to put on a ton of muscle in one year without checking yourself along the way. Set weight-gain goals every 2-4 weeks and evaluate the results. If you fall short, make an adjustment for the next goal. When you stop setting goals, you stop critical thinking and stop making gains. 4. MAINTAIN Every 8-10 weeks, take a couple of weeks to prevent a plateau. Don't stop training, but back off a little and let your body recover. Stop trying to get stronger and don't push sets to failure. After two weeks of maintaining your previous gains, go back to 110%. Reduce your calories during this back-off phase as well. This gives your body a break from digesting and utilizing all the food you need for growing. number of sets performed usually as the final exercise of a targeted bodypart. Basically, you train that bodypart heavy as you normally would on any given day, keeping the rep range at 8-12, but on the last exercise you perform the 7 sets to finish off that particular muscle, with minimal rest in between to get the best pump possible. For example, at the end of your shoulder workout, you could do seven sets of laterals, resting 30 seconds between sets. The resulting pump is insane! We don't list FST-7 exercises in this program because it should be used as an intensity-boosting technique as needed, and not in every single workout. Alternate the first exercise between dumbbells, barbells and machines. Use them all each workout, but change the order and angle. On all chest moves, you must arch your back, throw your chest high and keep your shoulders back. This takes the shoulders out of the movement. Low-rep flat-bench presses (fewer than eight reps) are a quick way to tear a pec. Use a full range of motion on all exercises. The only exceptions are intensity multipliers used on the last set. When you reach failure, push your muscles further with assisted negative reps or partials. 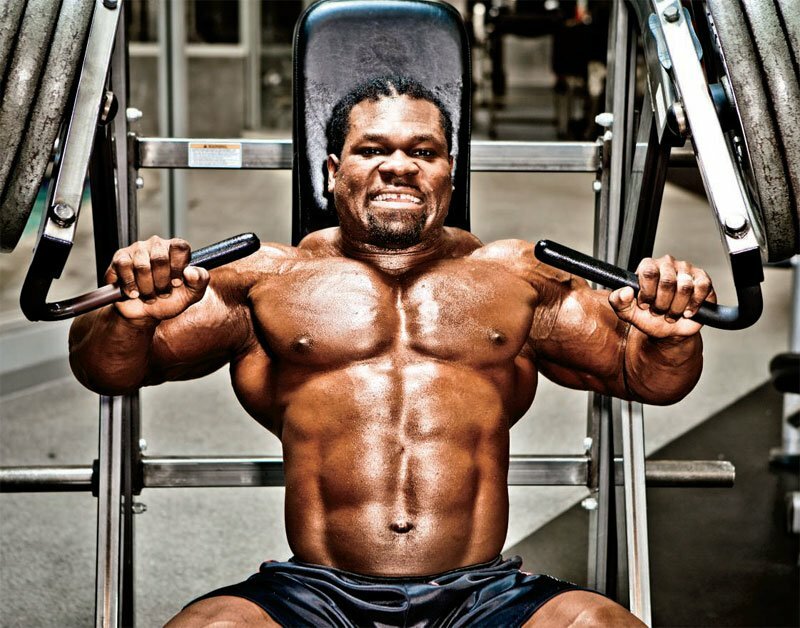 Lean forward on dips to emphasize chest. Change your stance on squats, hack squats and presses. This is like using a different handle on a cable for arms. Change your foot position on leg extensions to produce soreness (stimulation) in all areas of your quads. Change your total set count. Stay away from single-rep sets and weights you can't handle for at least 5-6 reps at the heaviest. A great alternate workout for hamstrings is the old 5 x 5 set/rep scheme with the stiff-leg deadlift. Using the same weight, do five sets of five reps, all to failure. Stiff legs are the only true compound movement for hamstrings. Form, form, form. Always arch your back and throw your chest high. Rounding your back puts pressure on your lower erectors and leaves you prone to injury. Wear a belt on your heaviest sets. Pull with your elbows. Think of your arms as hooks; don't squeeze and pull with your hands, squeeze from your back and drive your elbows down and back. Don't worry about the weight. The back is very strong and it's easy to have an ego trip, but hard to grow a great back. If the weight is too heavy you'll be pulling with your arms and rounding your back. Pullups are the best exercise for back development. Use them in every workout. If you can get more than 10-12 reps for three sets, start adding weight (use a "dip belt"). It doesn't have to be seven sets, so don't be afraid to experiment. It could be five, nine or anything in between. 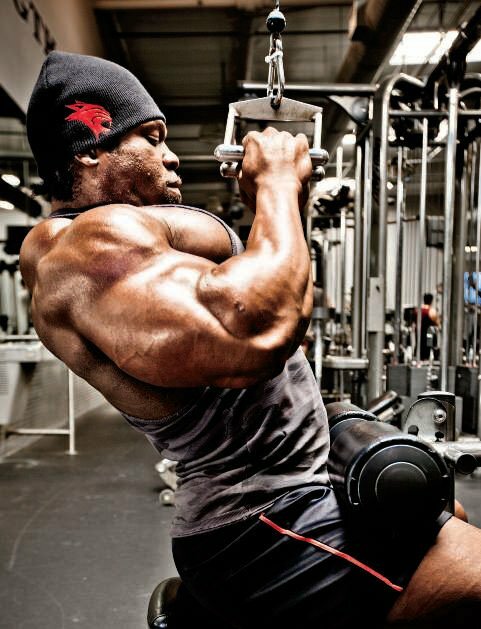 It's all about getting the maximum pump, so experiment until you find it. Sevens don't mean light training. You go as heavy as possible to hit failure at each set without breaking the proper form. Anyone can do seven light sets; the challenge is to do them with a weight that makes it hard! The stretching part of the exercise (the top of a pulldown, the bottom of a leg extension, etc.) is not more important than the contraction. The squeeze or flex of the movement is the critical point. Contract hard on every rep to get the most blood flow. It doesn't have to be done at the end of a workout. Sometimes I have my athletes start a workout with what I call preloaded FST-7. A great bodypart for this technique is biceps and the pump is unreal. Pick a biceps exercise that really isolates the biceps and takes out any shoulder involvement, like a preacher curl. Perform seven sets of 10-12 reps, resting only 30 seconds between sets. Then continue on with your biceps workout. Sevens don't have to be done on machines - free weights, cables and Smith machines can be used just as effectively. I recommend machines to beginners for safety reasons. The machine puts you on a fixed plane of movement and you can't get sloppy as you fatigue. If you decide to use free weights, you must pay extra attention to form. Work the angles. There are three sides to the shoulder muscles and countless angles to hit them. Sit, stand, lean; barbell, dumbbell, machine; use them all. Start the workout with a press. Hit the big compound movement while you're strongest. Don't be afraid to work your rear delts near the beginning or middle of the workout. If you always do them at the end they will never grow! Warm up your shoulders, chest, triceps and rotator cuffs before training. The shoulders are vulnerable to injury. Try seated lateral raises to really isolate the side delts. This is my favorite move to build round shoulders! Keep your shoulders back on all biceps curls; it's very easy for your shoulders to take over and move the weight. For dumbbell curls, supinate your wrist as you curl up. 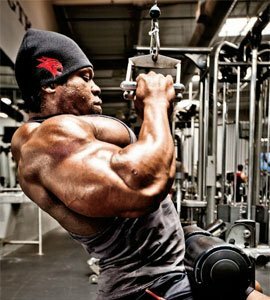 Think about turning your pinky outward for maximum biceps stimulation. Don't be afraid to mix up your arm training and throw a triceps movement in the middle of the biceps workout or vice versa. You can also occasionally try supersetting biceps and triceps. Triceps grow best from old-school movements like close-grip bench presses, lying extensions and cross-bench dips (with weight on your lap). Preloaded FST-7 (see the sidebar "FST-7 Myths" for an explanation of this technique) is designed for arm training. It makes for a great mind-muscle connection that will blow up your arms! Calves are trained twice per week at the start of the workout: on Monday before chest and Friday before shoulders. Don't train calves before your quad and hamstring workout. You might not realize it but calf training fatigues your legs. Train abs twice per week at the start of the workout: on Thursday before back and Saturday before arms. Use short rest periods for abs and train each set to failure. Change the order of exercises for both calves and abs. a. For abs, rotate exercises so the focus of the first exercise changes - sometimes start with upper abs, sometimes start with lower abs. b. For calves, rotate the fi rst exercise between standing (legs straight) and seated movements. Even if your training is perfect, an incomplete diet will prevent any muscle gains. If you want to grow, you've got to eat, and the most important key to growth is a caloric surplus. The excess calories will fuel growth and provide the energy to train. Rambod breaks down the guidelines on how to eat and supplement for maximum size. BALANCE YOUR PROTEINS: Take in protein of all types from all sources — fast acting, slow acting, whey, casein, egg, fish and animal proteins (beef, chicken, turkey, etc.). WHERE'S THE BEEF: Beef is great for offseason growth. In addition to the amino acids, you get tons of B vitamins, iron and testosterone-boosting fats. JUNK IT UP: Don't be afraid to eat some junk food once or twice per week. This boosts your metabolism and gives your body a different type of fuel. Stick to the "clean junk." These are calorically dense, but not super greasy foods. Examples are pasta, burgers, steak, sweet potato fries and cheesecake. BALANCE YOUR CARBS: If you want to grow, insulin spikes are your friends. You just have to time them correctly, like breakfast and postworkout. These are the times to have some fast-acting carbs that quickly replenish glycogen stores. Should contain Vitargo, Karbolyn dextrose, or maltodextrin. Should contain NO boosters, creatine, beta-alanine and glutamine. Should contain BCAAs, creatine, glutamine, and NO boosters. Training and diet will make up the most of your program, and if you nail them both the gains are sure to follow. But with all that effort, you'd be selling yourself short if you didn't add in the proper supplementation. This final 10% will set you apart from the rest. Avoid stimulant-based products preworkout when you are trying to grow. Stimulants like caffeine restrict blood flow and kill your pump. They can also screw up your sleep pattern and ruin your appetite. Rambod's method to keep you lean is simple: take progress pictures every two weeks. When you compare your photos to the previous set, you'll see what really changed. If you see more new fat than muscle, then it's time to reduce the calories and add in some cardio. It's hard to be objective in the mirror each day, so take pictures - they don't lie! Branched-chain amino acids are great for building muscle. Try 5-10 grams of pure BCAAs three times per day: preworkout, postworkout and before bed. If you can't get enough calories from food, then drink the rest. Weight-gaining shakes have a place, but don't depend on them. Whole foods should always be the primary source of calories. Creatine should be part of any muscle-building plan. Five grams per day is perfect for cell volumization and a strength boost. A fast-acting carbohydrate drink postworkout will spike insulin and aid in nutrient transport. Your creatine and BCAAs will get to the muscles quicker to start building and repairing.